My two days with Pat amazing! Sunday, the fish were pretty tightlipped, but all the fish she landed were really big! She had an epic battle after hooking into a really hot fish that had her well into her backing within seconds! Figuring she wouldn’t top landing another fish like that, she called it a day. Today the grab was on all day! She consistently landed fish in the 16-19 inch range all day. It is always a pleasure guiding her on the Sac! I had the pleasure of spending the past two days with Ted, Jim, and their sons. 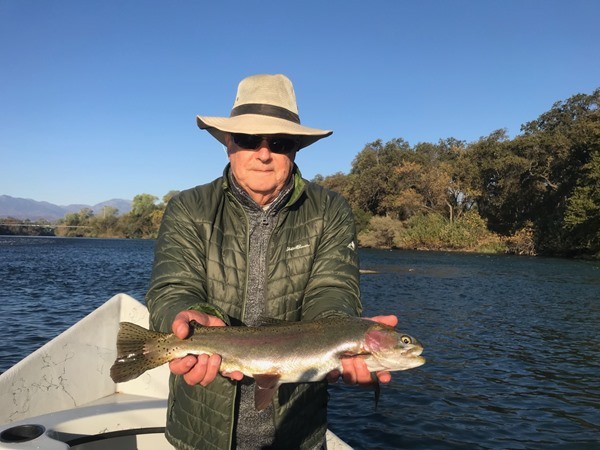 The weather was unusually hot for this time of year, and the water is very low and clear, but we managed to hook into some really nice fish both days. Friday, Zack hooked into a really nice fish right away, but it broke off during a run. Zack connected again with a small hatchery adult after lunch. Today, both Ted and Tommy hooked into a few nice fish throughout the day. Being so early, I am encouraged and look forward to the rest of the season on the Trinity! 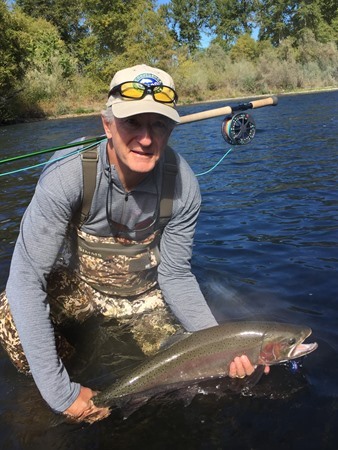 We didn't get the photo we wanted today but we managed to connect with several exceptional Trinity steelhead today. Two were in the 10-pound range and the rest were over 5 pounds. These fish tail-walked, cartwheeled, and made blistering runs that are more characteristic of fish caught closer to the salt. 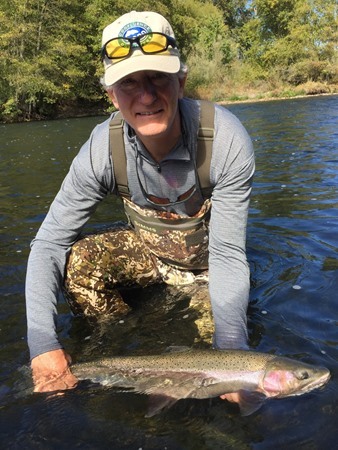 These are encouraging signs for our Trinity steelhead season that is just getting under way! 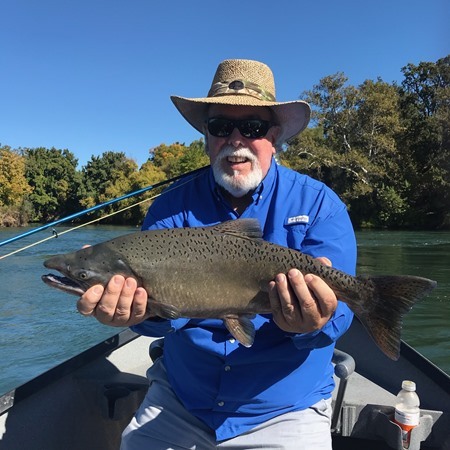 I fished up in Redding today with regular guests Steve and Rick from the Bay Area. The fishing in the morning was amazingly good! 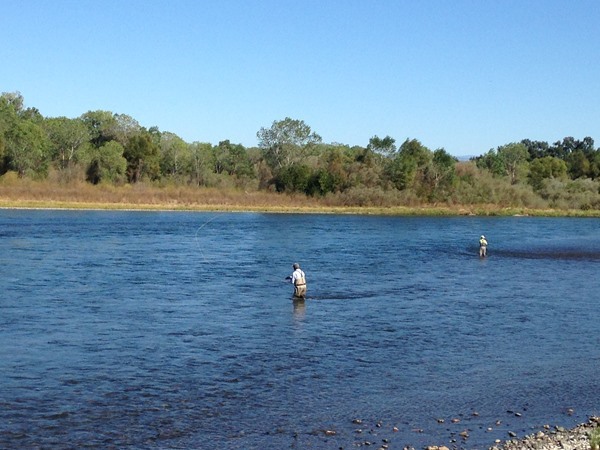 We fished egg patterns in the salmon redds all morning and connected with many fish in the 18-21" range. The fish were in great condition and many were in the three pound range. The big fish really come out this time of year - about a dozen of the fish we caught today would easily be the big fish of the day any other time of year! There are respectable numbers of king salmon spawning and there is also a really good caddis and baetis hatch going on. We caught a couple fish on nymphs in the afternoon, but today the fish were pretty focused on eating salmon eggs. another Nice one Jon ! 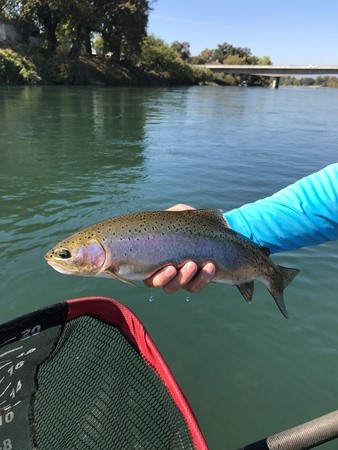 Steve and I had an awesome day fishing the Balls to Jelly's float today, catching all the trout we wanted and a salmon in the Barge Hole as a bonus. 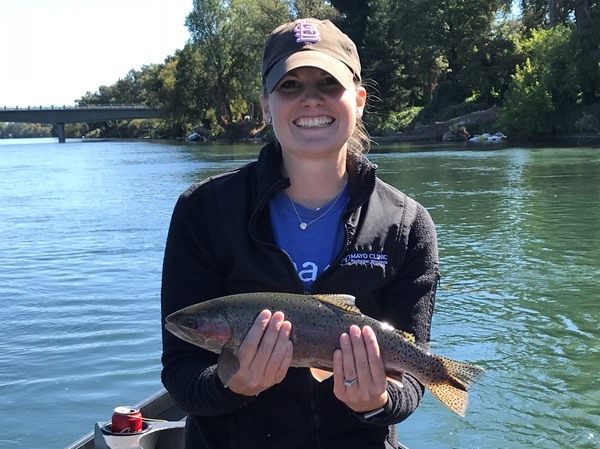 Beautiful weather, good company and great fishing makes for big smiles on the river! The nymph bite continues to be consistent throughout the day. My guests David and Karl, another father-son team had a great day! Other than a few brief lulls, they had solid fishing all day. The long range forecast is calling for beautiful weather this week, but there is a possibility of rain next week – which is much needed as we transition from the Sac to the Trinity. 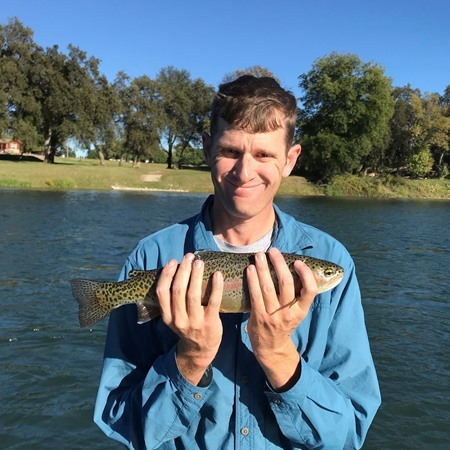 Lower Sac: Oct 14, 2018, by Brian: Windy! Today my guests were father-son duo, David and Corbin. 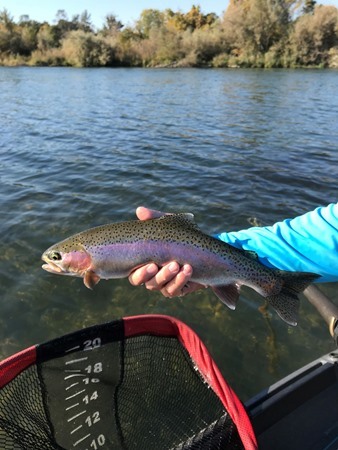 This was their first time fly fishing and we had a great time considering the extreme wind. They worked hard and both hooked into some really nice fish throughout the day. 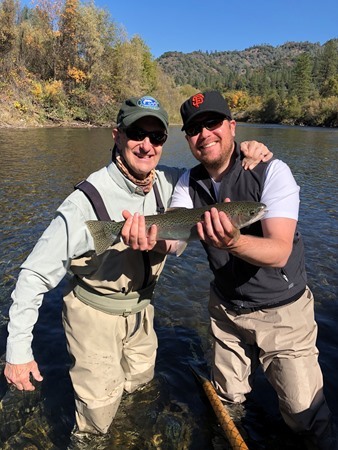 David and Corbin were “hooked” on fly fishing by the end of the day! I had a great time with guests Bruce and Rick today. The wind made for challenging conditions, but the fishing was pretty good. 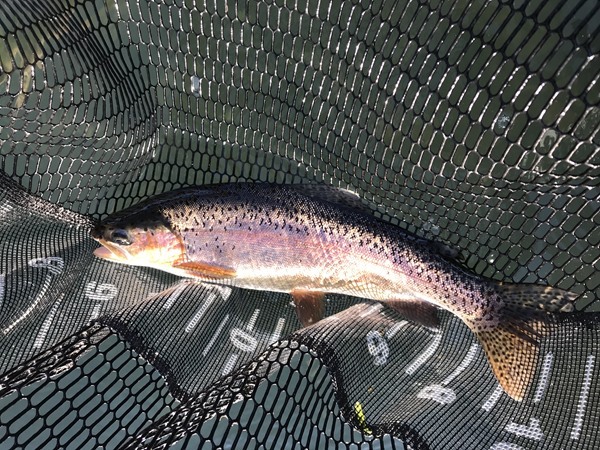 I’m seeing good numbers of post-spawn salmon, but the fish seem to be more interested in eating nymphs than egg patterns. 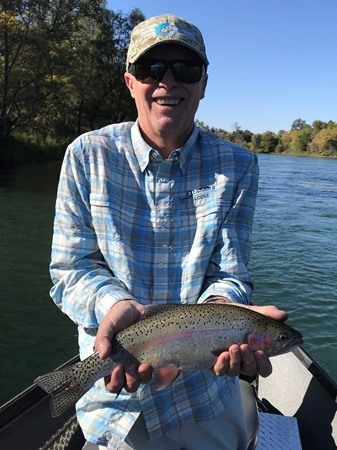 They had a mix of large (17”-19”) and small (12”16”) fish throughout the day, but Rick lost a really large rainbow when it broke him off. As good as the fishing has been recently, things slowed down today for my guests Steve and his son Evern. 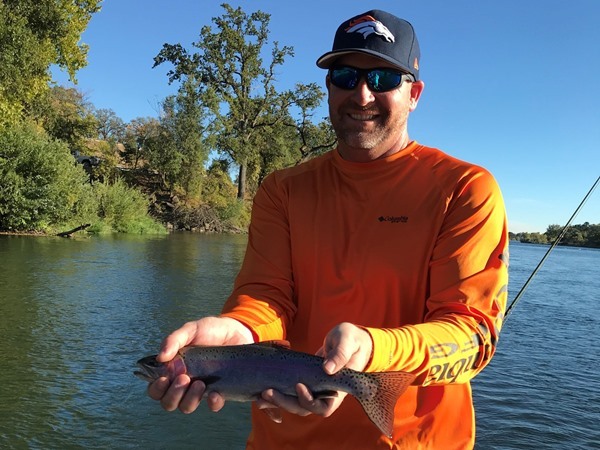 This was their first time fly fishing, so they experienced the same struggles all new anglers have. 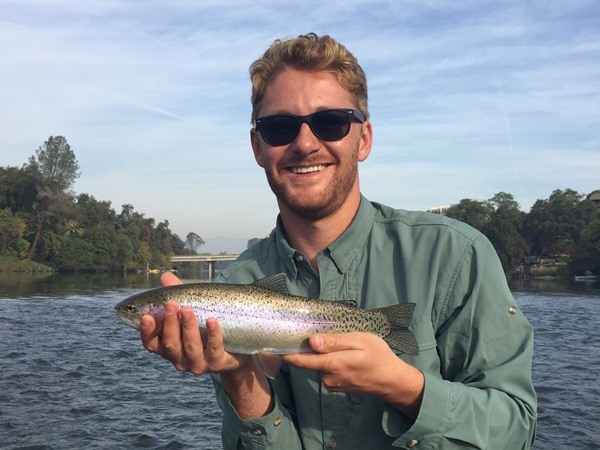 They hooked into several fish, but quickly learned it’s harder to land them than hook them! They worked really hard all day and both were rewarded, but the best was when Evern landed a beautiful 17 inch fish near the end of the float! I had a great day on the Sac with guests Joe and Paul. The grab was pretty consistent throughout the morning, but we did have a few short lulls after lunch. They hooked into some really nice fish today – they won some of the battles, and lost some of the battles. 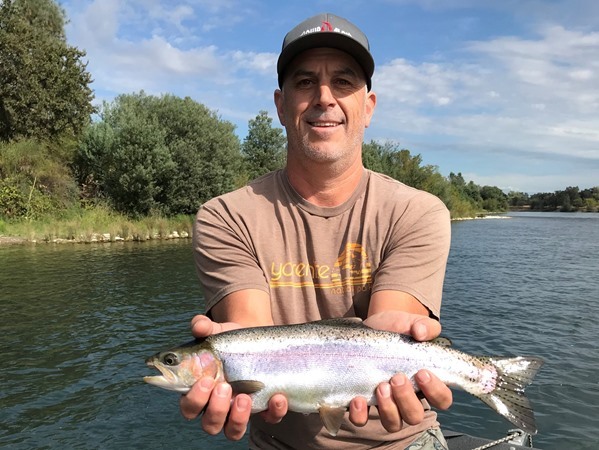 They were doubled-up twice and Paul had just landed a fish, so I dropped his flies back in the water and as he lifted his rod to recast – he hooked another fish! The weather is perfect and I only have a few open dates before the fun slows on the Sac. Joe with a nice one! This was a workout for Paul! 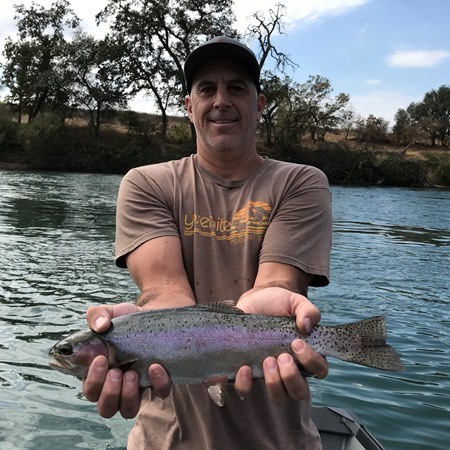 Eagle Canyon: Oct 9, 2018, by Andrew: Win an Eagle Canyon Trip for 8 people at F3T! 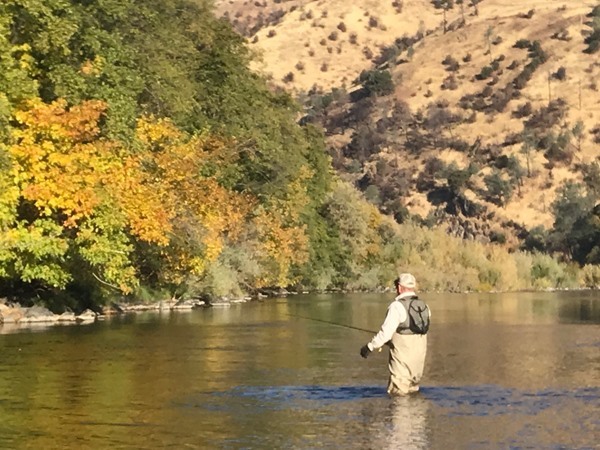 We are donating an 8-person trip to Eagle Canyon to the silent auction at the Fly Fishing Film Tour in Redding this Saturday Oct 13th. Look for the Eagle Canyon item in the silent auction area at the front of the Cascade Theatre. 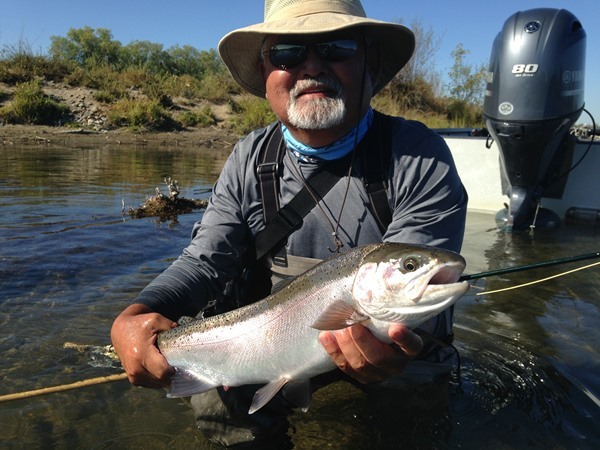 The winner can bring a group of up to 8 anglers to Eagle Canyon for a full day this coming season - a $1,080 value. 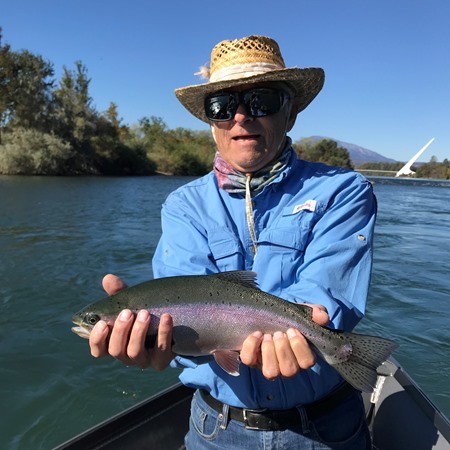 All proceeds from the Film Tour benefit our local Shasta-Trinity-Cascades chapter of Trout Unlimited. 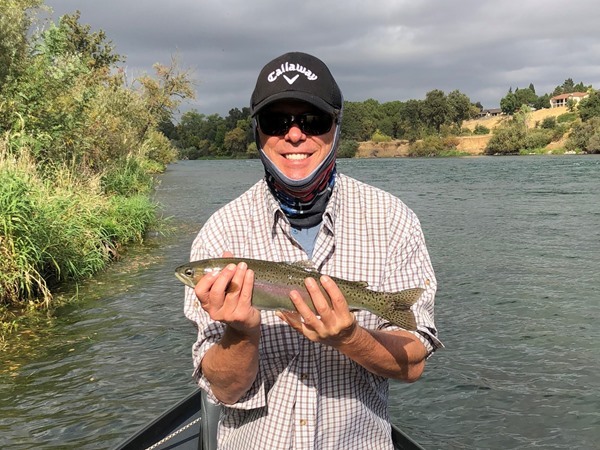 Northern California: Oct 8, 2018, by Andrew: F3T is in Redding on Saturday! 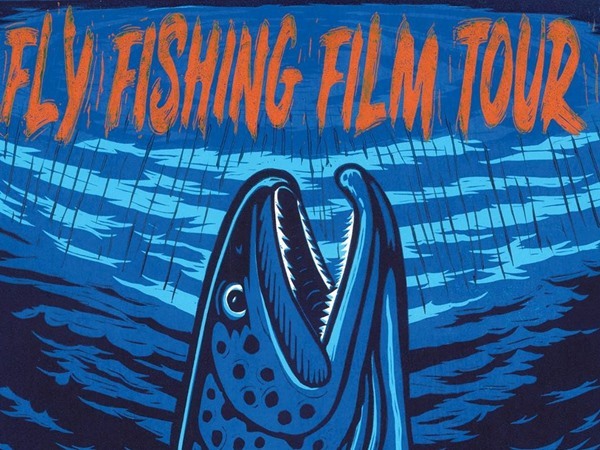 Don't miss the Fly Fishing Film Tour at the Cascade Theatre in Redding this Saturday! 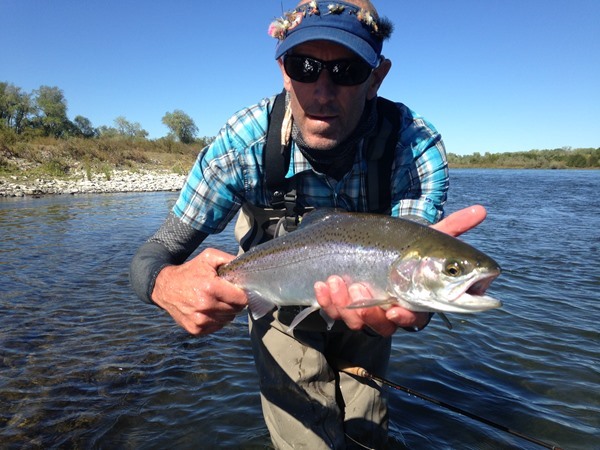 The F3T is a very entertaining collection of the year's best short-format fly fishing videos. The show begins at 7pm at the Cascade Theatre. Tickets are $25 and can be bought online at cascadetheatre.org or in person at The Fly Shop in Redding. See you there! Today was a great day with guests Tom and Leslie from St. Louis. 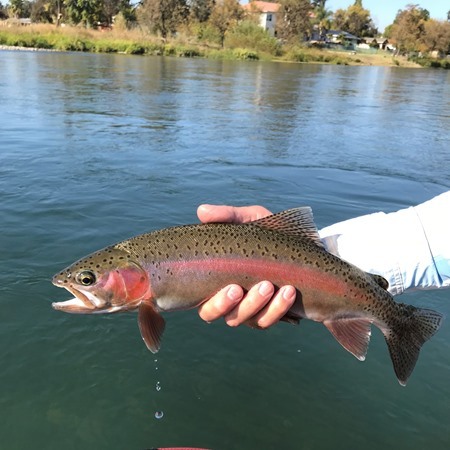 They came to California to celebrate their 10th anniversary and wanted to start their vacation by fishing the Lower Sac. Neither had ever fly fished, but you would never know it. The grab was a little slow to start, but things picked up mid-morning and they started hooking into some really nice fish! 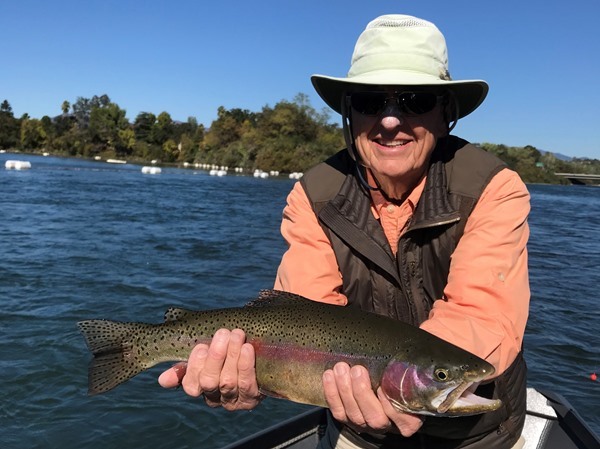 Tom and Leslie landed some very nice fish and lost some really nice fish, but they had a great time! It was so fun to be able to introduce them to fly fishing and I have a feeling they will continue this journey we all love some much. Happy 10th anniversary to a really great couple! 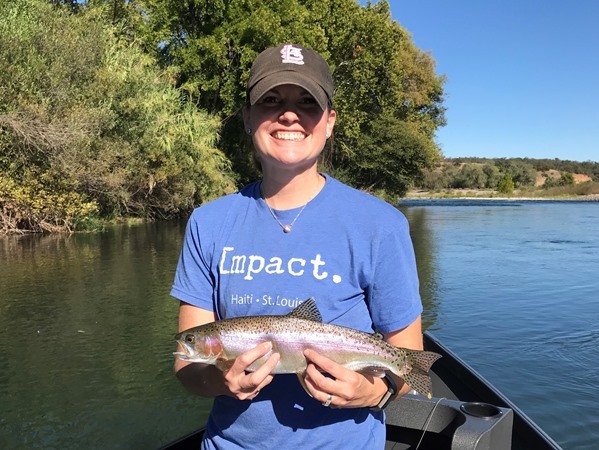 Leslie with another great fish! Tom is making this look much smaller than it really is! I had the pleasure of guiding Glenn and Tim on the McCloud today. This was the first stop of their 3-day fishing adventure. We pulled out all the stops but the fishing was pretty slow. They prefer tight-line (ESN) nymphing to fishing indicators. This is usually extremely effective technique, but they hooked a handful of fish each. We tried streamers and struck out. A very brief hatch came off, but was over by the time we made the switch. 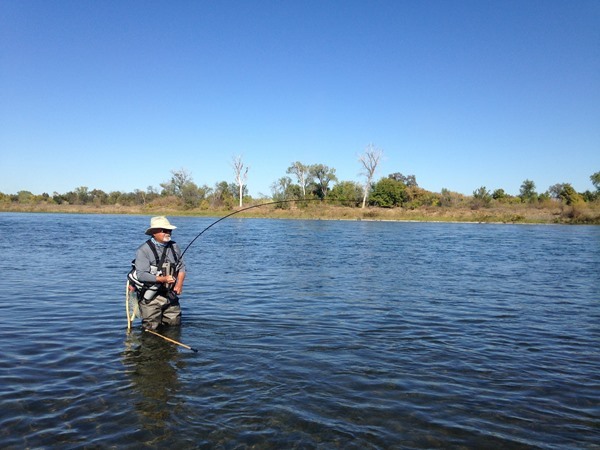 Towards the end, Tim switched to an indicator rig and started hooking fish. They worked very hard but the fish were not on the job. On to the Rogue with Leslie Ajari! 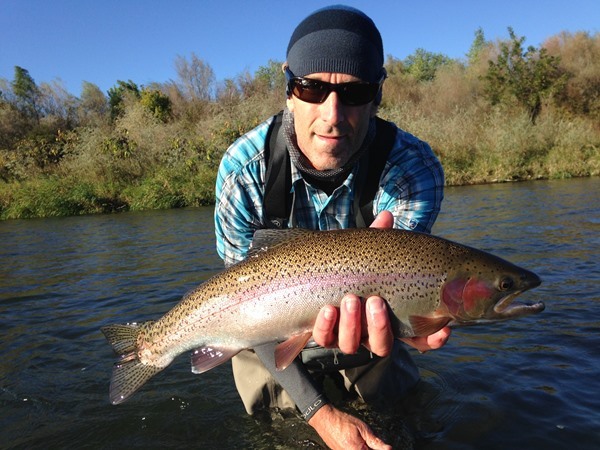 These photos are from our guest Mike who fished with Gino last week on the Upper Rogue. Mike says: "A terrific day with the Big Guy!" The fishing was really good again today on the Sac! I was part of a 3-boat trip and everyone seemed to have a really good day. 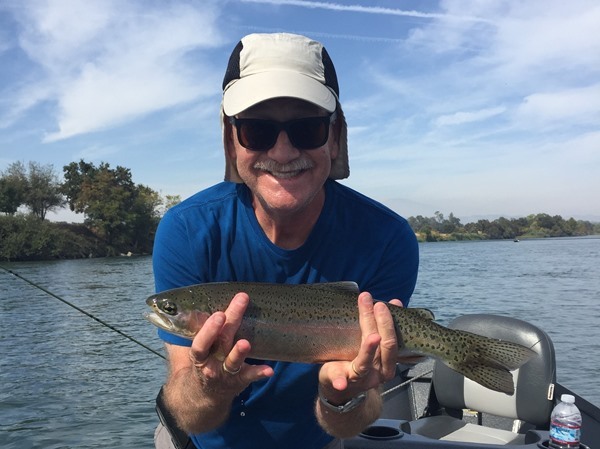 My guests Roger and Blake had an amazing day and quickly learned our Lower Sac trout are really hard to land! We had lots of hook-ups all day long, but a weather system came in late afternoon and the grab definitely slowed down for us. We had a great day and it was a great group of guys. 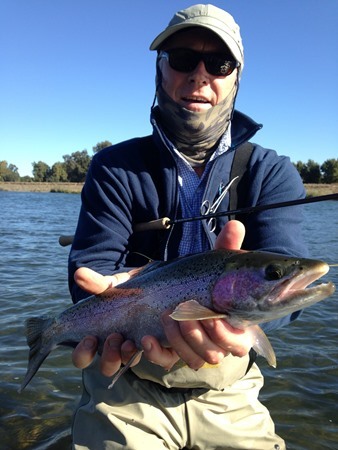 Fall is finally here and this is a great time to fish the Sac! 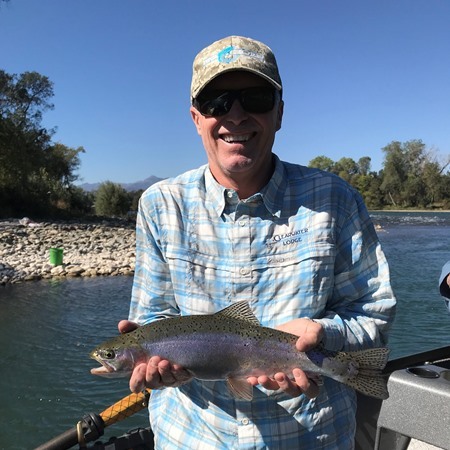 I had another great day fishing the Sac with guests Kelly and Greg. They came up for the day from the Bay Area - the grab was on right away and stayed on all day! We had a few very brief lulls, but the fish were super grabby so we had non-stop action. Such a fun day getting to know them and they were amazed at the beauty of lower river. Most our fish were 14”-16”, but they both hooked a couple each around 18”. Small mayfly nymphs have been the best producer the past two days. Fall is here and the egg bite should start any day now! 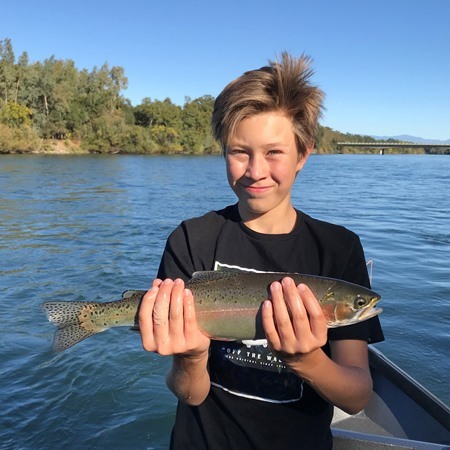 The Sac fished really well today for my guests Andrew and Wyatt. 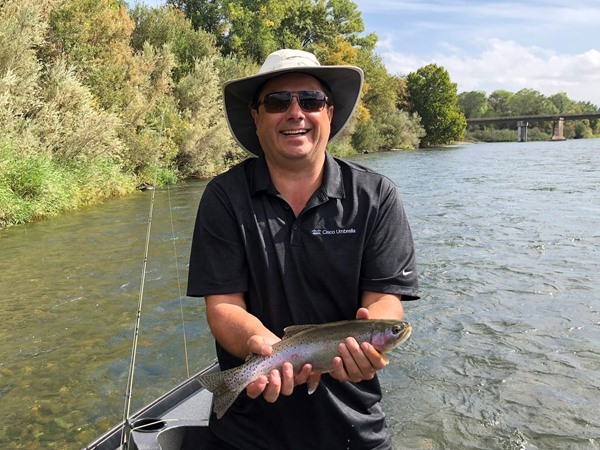 We hooked into three nice fish right away, then the things slowed a bit down for about an hour – then it turned on! Andrew and Wyatt were hooking fish consistently all day long. We had a few doubles and most the fish landed were 15”-17”, but Andrew landed one 18”-19” fish after an epic battle. 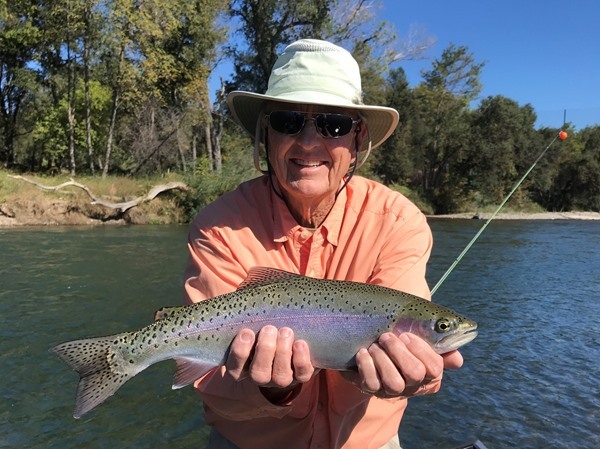 The flows are great and the temps are starting to cool, which makes for great fishing conditions.